Which Oils Work Best in Conditioner? For dry hair, oils are important for another reason. Porosity is a key factor in the ability of your hair to maintain moisture. The more porous your hair is the more water it can absorb. Seems like a great thing but there is a flip side to this – it will lose a lot of moisture over time as well. Overly porous hair can be corrected with specific steps. Additionally, conditioners that contain oils can help seal moisture into the hair strand better than those without and this is important for help to keep moisture in the hair. I personally have no issues with using coconut oil in my hair, especially when it’s used with other conditioning ingredients in a formula. My hair is extremely soft, flexible and moisturized. If you’ve played around with coconut oil and have found no benefit to your hair then leave it out or try fractionated coconut oil instead. It’s coconut oil that’s had a number of fatty chains removed resulting in a very light weight oil that still offers great moisture to the hair. Shea butter helps to moisturize your scalp. It may be able to penetrate the hair shaft to offer moisturizing and can create a light occlusive layer to prevent further damage. It also contains allantoin that will help with reducing inflammation and increasing cell regeneration on your scalp. The key to using conditioners with oils is really knowing why they are in the product and how they will benefit your hair. They are there to improve the condition of your hair, not make it worse. How do using conditioners with oils affect your hair? Do you love them or loathe them? For Part 1 of this series, click HERE! This article was originally published on July 2013 and has been updated for grammar and clarity. This article is very helpful. I'm making some homemade hair mixes and need to know what oils are best. I've always wanted to try coconut oil. Thanks! I do a prepoo with Vatika Oil and Suave Naturals conditioner, shampoo, then mix whatever conditioner I'm using with either coconut oil or olive oil. I use grapeseed oil and water everyday as a moisturizer. I like coconut oil and olive oil on my hair before I apply my deep conditioner so that the oil is underneath the deep conditioner. My hair is soft and moisturized. I even seal with coconut oil or Carols daughter Mimosa hair honey after I apply my leave in and curl cream. For my pre-shampoo DC's on dry hair, I apply coconut oil and top it off with a layer of Shea Moisture Purification Masque or I apply a mix of Lily of the Desert aloe vera gel and castor oil. My hair feels super soft and supple after these treatments! Coconut oil and castor oil really help my hair retain moisture when used in this manner. I always look for oils in conditioners, leave-in conditioners and moisturizers. I look out for heavier oils--shea butter, castor oil, coconut oil, avocado oil, palm kernel oil, etc. Oils like sunflower oil or jojoba oil are too thin/light impart to add lasting softness to my Afro-textured hair. I love mixing oil with my conditioner especially for my prepoo & also it gives my conditioner even more slip for when I detangle. I feel that the oil also helps to lock in the extra moisture from the conditioner, which leaves my hair feeling amazing. 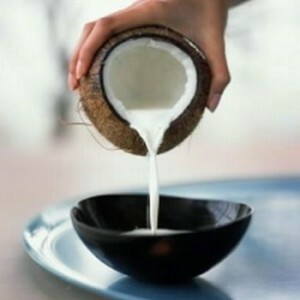 Why is the picture shows coconut milk, while the article is about coconut oil?